We wanted to leave Great Harbor Cay as soon as the sun came up and had let the marina know of our plans so someone would be there early. Not only were they not there early, they weren't there on time either. Since our electric meter had to be read to settle our bill, we couldn't pay the night before. I had to call one of the marina staff at home to get them to come over and check us out. Finally it was all done and we left about an hour behind schedule. 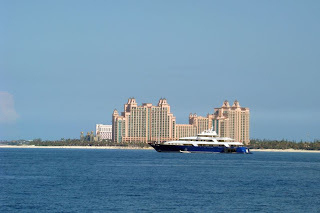 The wind forecast was for light and variable winds all the way to Nassau. As we headed north to the Stirrup Cays so we could go east then south, the swells working in off Northwest Providence Channel got a little larger. As we approached the top, the wind picked up some too and it got quite choppy and rolly. The day was also gray and overcast, and we hoped it wasn't going to be like this the entire day. We could see a cruise ship anchored off Little Stirrup Cay already. They probably had been there all night. The islands, Great and Little Stirrup Cays, are owned by the cruise lines and they have them all set up for their passengers to enjoy time on the beach. There was surprisingly a lot of traffic as we approached the ship anchoring area. There were a couple of pleasure boats, including ourselves, a large schooner at anchor and several of the ferries that take the passengers from the ships to shore, milling around. As we approached, another cruise ship was coming in to anchor. The cruise ship hailed the schooner that was anchored to let them know he was in their spot. The schooner quickly pulled up anchor and moved. There's no arguing with something that big. As we rounded the northern tip of the Berry Islands and moved into deeper water, the seas went flat and the sun came out. The distance from Great Harbor to the Nassau Harbor entrance is 65 nautical miles. For the next 9+ hours we had a glorious day and a perfect trawler crossing. Once we were off soundings in the very deep Northeast Providence Channel, the seas were completely flat with the exception of long gentle ocean swells. The winds were light to non-existent during most of the transit and we just let the autopilot do the steering while we read, relaxed and listened to Margaritaville on the satellite radio. Life is good sometimes. 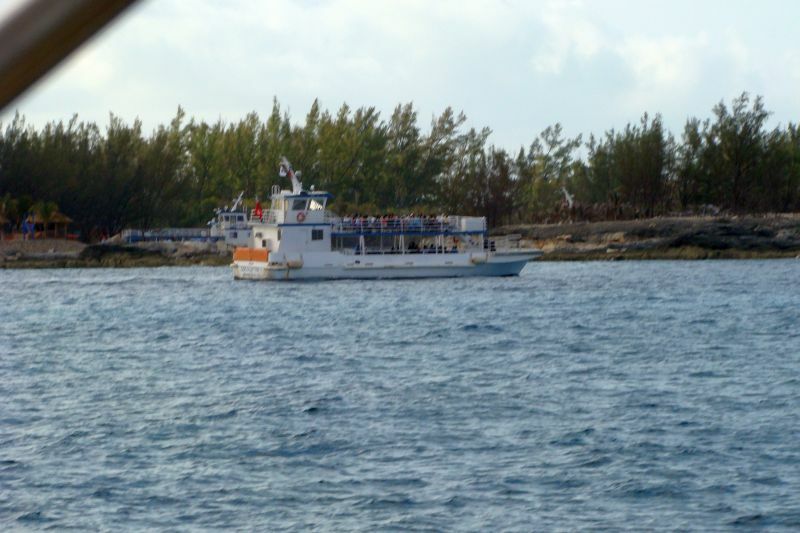 From Little Harbor Cay in the Berry Islands, Nassau is a straight course to the southeast with nothing but deep blue water and no obstructions other than the occasional freighter or pleasure boat. If it wasn't such a beautiful day, some might consider it boring. And that's just the way we like it. 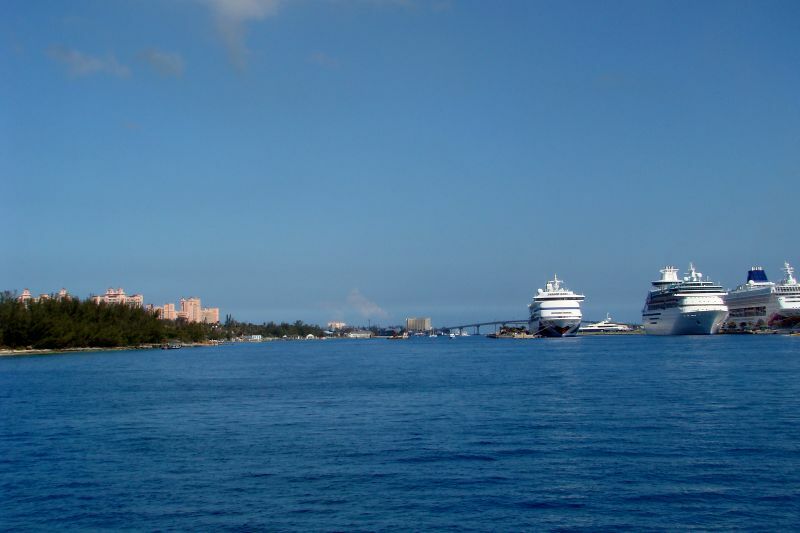 The entrance to Nassau Harbor is straightforward and easy. 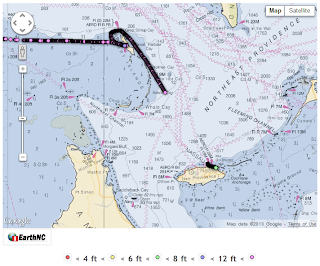 We arrived at the outer sea buoy at 4:20 PM, very pleased with our transit time. 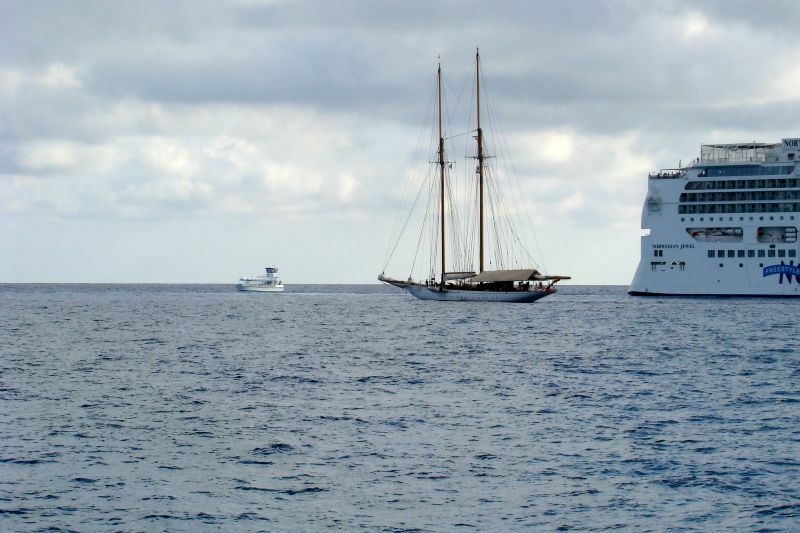 There are two stone breakwaters - one to starboard that protects the commercial ship port, and the other to port that extends out from the western tip of Paradise Island and the Nassau lighthouse. 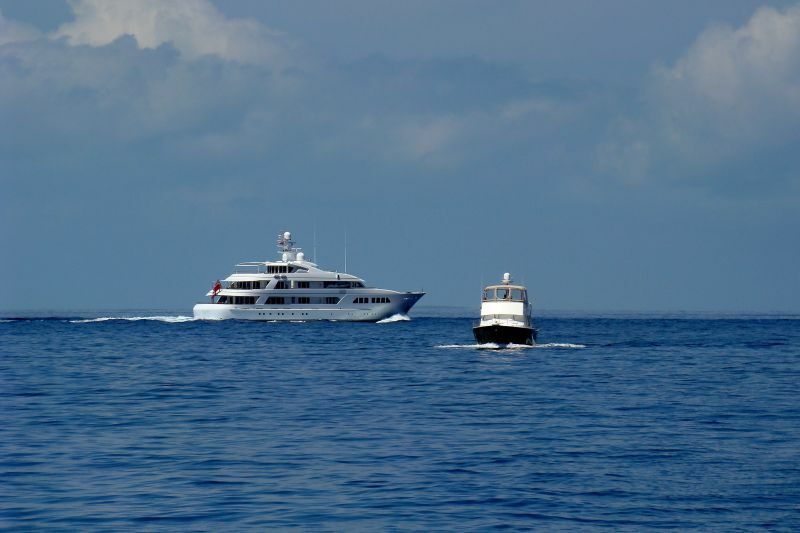 As we approached, a small freighter was exiting the harbor and a very large, dark-blue hulled yacht was at anchor just outside the harbor. 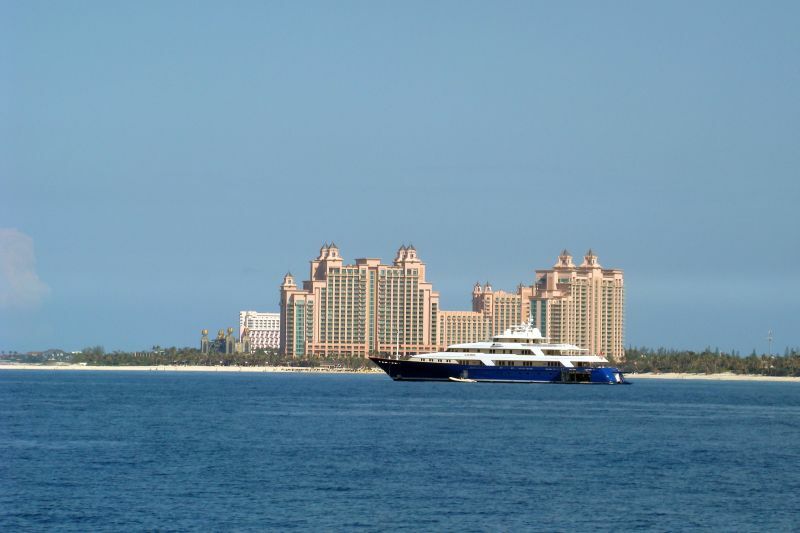 It is necessary to call Nassau Harbor Control on VHF Channel 16 and request permission to enter the harbor. 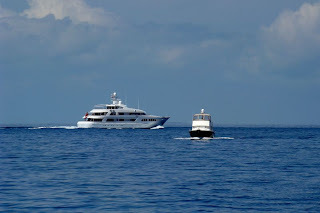 They will request the boat name, last port of call and your destination in the harbor. 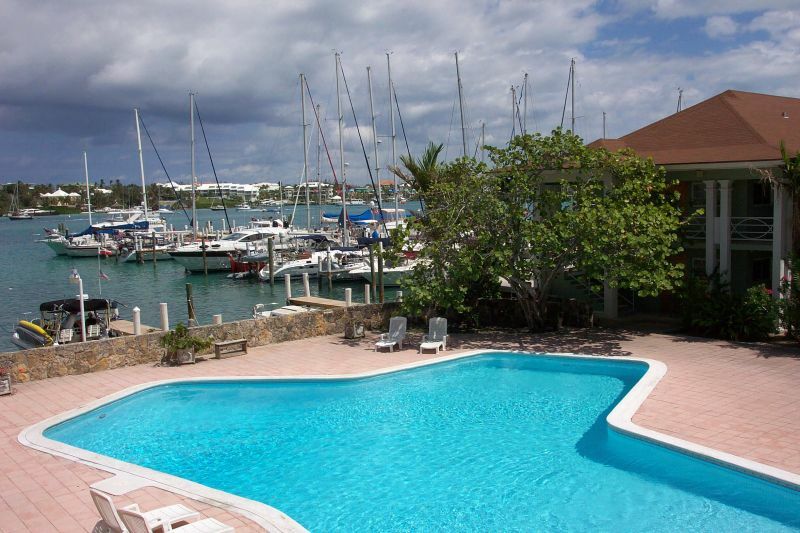 We would be heading to Nassau Harbor Club to sit out the upcoming weather and enjoy what Nassau has to offer. Once in the harbor you are quickly snapped back to reality. The very busy comings and goings of tour boats, ferries, pleasure craft, and all manner of vessels, most traveling at full speed, is almost a shock to the system. 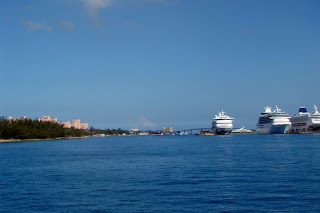 The first thing that sticks out is the cruise ship terminal, and there were three ships docked on the day we arrived. We were surprised to see one of the ships painted with a bright red smile on the bow. Given all the bad press from the cruise lines lately, it was even more comical. We would need to transit the bustling harbor almost to the east end. After crossing under the two high-rise bridges to Paradise Island, we opted to lake a sharp right after the dock on Potters Cay and run inside a sandbar that divides the harbor on the east end. This did cut down on some of the wakes and got us out of the heavy traffic. At 5:00 PM we secured Beach House in her slip at Nassau Harbor Club. It was a long day but we felt pretty good. It has been many, many years since we were in Nassau last. In previous years, we have chosen to bypass it for more isolated anchorages and Cays. It was a good place to hole up for the weather and wind direction that would be coming in a few days. On our last cruise here we waited 10 days for weather before we could head south to the Exumas. Let's hope it won't be as long this time. For the next few days, we plan to take in the sights and do some of the touristy things. The marina here is one of the less expensive ones in the harbor and it has a good reputation. The location is also great for re-provisioning and getting whatever supplies we might need before heading off to more remote anchorages. We didn't vanish during part of the crossing. Our Argus system only works when the depth sounder is on soundings. Once we cross into deeper water, it will not record until we are back on soundings.